Where did the other guy go? After a few months of being the first one to depart from the bike ride with the reason of “girlfriend” topping the list, or just being the first sensible one some mothers may conclude, I have found time to both reflect and slowly slip out of the lifestyle of the cross-country biker. I often find myself diving into my days work, planning weekends, trying to keep up with reading, politics, news, planning for my summer trip to India/Tibet (which i think will be more of an India/Nepal trip with the current political situation in Tibet) and attempting to keep up relationships with family and friends. I also however find my mind wandering back to where the others are and what they are doing. I am often asked what my plan is and if I will soon be entering what some people have defined as “the real world.” Regardless of what the producers of MTV tell us I’m not exactly sure what our society defines as “the real world”, however I get the feeling it has something to do with a cubical, a mortgage, and yard-work. All of which are fine but after spending five and a half months biking across eastern Asia I haven’t been ready to just jump into that yet. My mind will often wander, to the other side of the world. To the interesting people I met, to the ones who treated me like family, to the one’s who tried to take advantage of me, to the one’s struggling to support their families, and to the one’s searching for meaning in life. One thing that traveling has done however is that it also provided me with material to compare my own culture and world to. Minneapolis Minnesota is truly a unique place, even if it is spending the weekend mowing the lawn. The truth is that most people in this world don’t do that. I find myself viewing people I meet here in the Midwest as much more interesting than I had with my know-it-all attitude after graduating high school. Overall I’m pretty proud to represent the Midwest, and am not afraid to flaunt it. People have suggested to me before that when traveling I should tell people that I am from Canada to avoid the assumed stereotype that goes along with being American. Even though I have nothing against Canada I would be much more ashamed to not admit that I am from the U.S. I question how any one’s perception on the world would ever change about my country if I can’t represent it in a way as I see as fit. I feel I am a good enough representative and ambassador to talk with people in other countries about issues that relate to my country, if not I don’t have much business traveling. Secondly in most of my travels I haven’t really gotten too much negative feedback about being from the U.S. Sometimes the issue of politics is brought up but people are generally very understanding in separating a person’s personal life form politics, they too don’t always believe in all of their own government’s history. Consumerism - Gee gatz do we (including myself) consume a lot. From transportation, to recreation, to food, to our homes we consume one heck of a lot of goods. And as obvious as it is to anyone living in the U.S. I find myself hyper-sensitive to it. What others do doesn’t offend me, it’s a matter of comfort and who is to say people don’t deserve to be comfortable? Especially once someone is used to living a specific standard of life-style and that life-style is the norm for an entire population. Our society revolves around consumerism, buying, selling, buying, using, throwing away, buying, selling, it is a dizzying endeavour. I can’t quite yet fall comfortably into it without feeling just a little guilty. I try to live a low impact lifestyle but find myself constantly comparing my lifestyle to ones I have previously led and to ones I have previously seen. I believe there is a balance between consuming and living comfortably that can be met by just being conscience about how we are impacting our environment and each other. Just being aware of our impact helps us reduce when possible, even if only a bit. Being Green - Since I have come back I have noticed a huge tend to think “Green” Woohoo! I hope it isn’t more than that, a trend. I think some businesses are taking advantage of it and advertising as “green” even when they could do way better, but at least it has the potential to start changing minds. Right now as most of you know the gas prices in America are reaching about $4.00 a gallon, fine with me, let em’ keep going up. The only way people are going to change their attitudes is by affecting their pocket books. You won’t hear me complaining about high gas prices, besides, they are still about half as high as in Europe. One thing I don’t think some people realize is that not only our environment is at risk with our dependency on foreign oil but our national security as well. So to those politicians promising to “lower gas prices” and without clear plans for taking care of this problem but bolstering their stance on national security because they can go into the middle east and fight a war, shame on them. Lately I think of the saying “Think globally, act locally.” We must start with ourselves in order for there to be a change worldwide. Some of you may be wondering if since I’ve been back in “the states” if I am able to bicycle much anymore. The answer is yes, I do get the chance to bike and often. I know there are many reasons to bike but I personally use biking as a means to commute. I currently have two jobs, one being about three miles from where I live and one being about 14 miles from where I live. I have access to the cedar lake bike trail nearly the entire way into downtown and the green-way is only a short way off. I still end up having to drive twice a week or so but I try to bike whenever possible, mostly because I truly do enjoy it as a socially just way to get around. Another hobby of mine as some of you might know is fishing and earlier this spring I decided I needed a canoe. So for the past month or so I have been both pedaling and paddling on a regular basis. 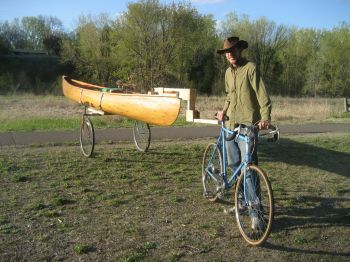 In order to keep the non-carbon emitting theme alive i have designed and built a bicycle trailer for my canoe to be pulled behind my bicycle and yes as you can imagine it is quite awesome. It probably weighs about as much as the band wagon but at 15.5 feet the canoe takes a little wider turns. Once I get going it really isn’t too hard to move, but you do feel it on the hills. I am two miles from Cedar Lake, which connects to the lake of the isles and Calhoun right in the heart of Minneapolis (which also happens to be stocked with walleye and muskie) People love seeing me ride and offer lots of support. When stopped people love to check out both the canoe and trailer. Overall I do miss biking, meeting new people, staying in small villages, being swallowed by huge cities, and never knowing what the next hour will bring. Thanks again for all the support, and I can genuinely say the other’s still biking seriously rock, let’s give them a round of applause for finishing the “Asian” portion of the trip, seriously, they just biked across Asia!!! Late notice but for anyone interested but there is a Minneapolis native performing at the Fitzgerald Theater this Saturday May 31st who previously did a cross-Europe bike trip with his accordion. Taking a stroll around Hoan Kiem lake in the middle of Hanoi one can meet all sorts of people. Food vendors, international travelers, or Hanoi residents chatting on benches. I happened to be share my bench with a former Vietnamese resident who was kind enough to share his story with me. Mr. Lee is 67 years old and has been living in Canada for the last 28. Mr. Lee grew up in Southern Vietnam, and in 1976 when the North fully integrated with the South to form the Socialist Republic of Vietnam life changed for him rapidly. He explained to me how there were no freedoms, how people were issued one shirt per year, all the same color. ”People were forced to live off of 3kg of rice a month, terrible. Even if you wanted more there was no way to get it.” He told me how his brother, a former presidential pilot was forced to go to a “reeducation camp.” He himself was spared because he was a water works engineer and was needed. He was put to work in one of the provinces of the South. With a tone of self disbelief he told me that in 1980 he and his brother took a boat from the southern coast of Vietnam to Thailand. He claims his brother’s navigational skills he used as a pilot allowed them to correctly make their way over the five day journey. The boat was 6 ft wide and 106 ft long. ”There were 103 people in it, and you could reach out and touch the water, 103 people!” They had to be very careful and skirt the international waters because there were Thai pirates known to seize the ships. The boat had one single-block diesel engine and would not restart if it was ever shut off, he knew this because once they reached shore they tried to restart it but could not. ”I don’t know how we did it” Mr. Lee exclaimed. Once in Thailand he made his way to Victoria Canada where he now resides. He lives there with his whole family, and spoke fondly and often of his grandson who likes to kayak, camp, and wants to someday spend more time in Vietnam to better understand it. This is Mr. Lee’s second trip back to Vietnam and has been traveling for about one month now. He was very interested to hear about our trip and thought it a wonderful idea. He thought it a great thing to do while young, he wishes he would have had the opportunity to do a similar thing at my age. “Now I have the money, but not the health” he told me. He had wanted to do a motorbike ride from Saigon to Hanoi but could not find anyone to do it with him, so he is traveling by bus. Of Vietnam today Mr. Lee has a very different outlook than he did 20 years ago. He thinks things are much better, as indeed for many they are, but still thinks people lack freedoms. He also told me that social mobility is a challenge and that for poor to become rich is very difficult. He feels that people in Vietnam are eager to look forward and put much of the past behind them, and with Vietnam being one of the fastest growing economies in the world it is not surprising. Mr. Lee for me was a great example of how change can happen in a relatively short period of time. From fleeing his country as a refugee he has returned as a tourist and was very eager to tell me of the beautiful places he had visited. I can only hope to have more genuine encounters like this one as we make our way towards Laos. I have been taking video this entire trip, you however be asking where it is. Alas, the process of buying editing software, downloading and installing (which under most circumstances would sound easy, but in the hinterland of China it can takes weeks) purchasing and installing extra RAM, spending hours net bars with thunderstorms of cigarette smoke, fixing my video camera which was broke for about 3 weeks, and figuring out how to compress and put all the files on-line I have finally started to become more regular with posting videos to the newly titled “Video” page. So go ahead and take a look if you would like. I have one longer video titled “China and the Environment: A cyclist’s Perspective” which you as of right now must download, hopefully I will be able to embed it in the near future. I also hope to keep more up-to-date with daily encounters, activities, and events that we participate in so keep checking back regularly. Before we arrived in Hong Kong, or the fragrant harbour to translate the name literally, our last 4 to 5 days of biking had been almost all downhill, funneling us ever toward the coast and finally ending at She Kou, a port city wrapped in the chaos that is ShenZhen and just across the way from Hong Kong’s new territories. We found the ferry terminal pretty easily, concluded that in fact we would be able to put all of our gear on the boat (for an extra 5 US dollars per bike if we carried them on ourselves) and then took off to look for a place to stay. The area right by the port was very developed for China and the effects of the spread of Hong Kong’s wealth was very apparent. Other foreigners could be seen being bussed in on huge tour buses, led off in a daze and shuttled through line in order to get onto the next ferry, we watched. Both baffled and concerned looks turned the necks of both travelers and the ferries employees. One rather tall almost slender man in a leather Harley Davidson jacket and a thick Australian accent asked us if we were doing a bike tour, our answer of course was yes. He promptly told us he liked to stick to taxis and buses. We began biking back up the hill towards the city in order to find a place to stay. Even though it was developed this area has seen an influx of millions of migrant workers in the last few decades and there must be cheaper places to stay other than the obvious large hotels in the area. The city of ShenZhen is a rather unique place. In 1979 then Chinese leader Deng Xiaoping declared it as China’s first economic free zone, opening a tidal wave of foreign investment and business. People soon began to arrive looking for work and opportunity. From a small coastal fishing village ShenZhen soon grew to millions. Today there is an official population of 9 million but the surrounding area brings that up even more. The average age is less than thirty, and a major problem is that people do not possess the hukou, or resident card, making work difficult or illegal. I personally knew a number of people moving to ShenZhen after graduation when I worked in Changsha, I still know of one there today. People from all over the country of China fill this city, with little or no family, friends, or social network. Crime becomes a problem, prostitution is a problem, and disease can become a problem, in fact the SARS epidemic first started in this region and quickly spread among workers stacked in housing and dormitories with few health precautions or health education. The book China Syndrom by Karl Taro Greenfeld discusses both concerns of this city in detail and the SARS epidemic. Although the night before we had stayed in factory style dormitories, a cement room, a spicket to wash in, we were lucky enough to find another option that turned out to be a great experience. We were asking a young man if there were any inexpensive Luguans in the area and he mentioned a few. After talking with him a while though he said he knew a place we could stay and we should follow him. He led us back to an apartment complex, he riding an electric bicycle, a common mode of transportation in China, and us on our bicycles. We stopped in front of a steel garage door, it opened into a large cement garage, two rooms were made in the rear out of plywood dividers, there was more than enough room for us to put our bicycles and sleep on the floor with our camping gear, we said it looked great, because it did, and he showed us a good place to eat dinner. Although he did not want to eat with us he said he would return, which he did after our meal to bring us back. We returned, set up “camp” and began to talk. His name was Zhou, he was 24 years old and part of the Yizu 彝族 minority group one of the 55 recognized groups by the Chinese government. Because of this he told us he was given a few different benefits that other Han Chinese are not. He gets extra vacation time on his minorities holidays to go home and visit with family. He also gets a small amount of money from the government. For two years he worked in the military in Tibet. Although he didn’t like it much because the weather was too cold. He then lived in Malaysia for a while, then moved to ShenZhen. He works two jobs and lives in this building with his girlfriend. He is a security guard at a nearby location and also delivers tanks of natural gas to people by means of his heavy duty 28 inch bicycle. Not too long ago he got injured at work and was sent to a hospital in Macau to recover, a rare thing among common workers, and he told us we should go there to visit if we get a chance. He crossed the street and brought back peanuts, Pepsi, a case of beer, and a few people to look at us. We sat on our camping mats, chatted, played music, and ate snacks. In the morning we got up early in order to make it to the ferry on time, he was up already though getting ready to go for a run. In the military he had to run 10k a day, he now runs 5k every morning to stay in shape. We graciously said thank you, offered just one more time to give him money which he would not accept, and then biked off to find breakfast and our way to the ferry. We encounter all kinds of people everyday, and when someone goes out of their way to help us, especially when they don’t have a lot to start with themselves it really speaks loudly. We are expecailly thankful to people like Mr. Zhou for giving us insight into their lives and offering us a very uniqe experience. Biking along the dreadful G107 last week we, as usual, decided to stop for lunch somewhere around mid-day at a roadside restaurant. This particular place was perhaps a little nicer than the ones we usually stop at, but it would work all the same. There were a number of tables filled with Chinese people playing cards and smoking cigarettes. We took the table near the front window as usual so as to be able to watch our bicycles. We ordered a number of dishes, mostly delicious. There was one soup however that we ordered that we weren’t too sure of its contents, some mystery fish, the taste ended up being a little less tasty than we had hoped. We are generally really good at making sure we eat all of the food we order, with Pete reigning chairman of the clean plate club, with this being only the second dish we have not finished on this trip. Anyway while trying it Pete found something floating in it, small, black, with wings, and probably packed with protein. A fly of course, not too big of a deal, yet kind of funny all the same. We all thought it was pretty funny, as if it were a perfectly normal thing to accidentally bring a bug soup to the dinner table. Well maybe I found it a bit more funny than the rest but humor can be contagious. For the record it is not a common thing to see bugs on the menu in China and I have never seen a bug soup, but Nakia and I did try deep fried silk worms once. While this was going on Nakia was purchasing a pomelo, a large grapefruit like fruit. She brought it back and was going to begin eating it. “You can’t it that like that, your hands are dirty! You need to go wash them, I have boiled water you can wash them with, you need to wash your hands first.” she said. “Oh you are probably right, but I think it is alright, I will try to eat it like this.” I said. Nakia began to eat the fruit. “No no no, you are doing it wrong, open the skin.” said the woman. She then took each slice, opened them for us and gave them for us to eat, we did not have to use our dirty hands and they were more delicious. We all found it particularly humorous. I gave her my notebook and a pen. “Wait a minute, I will be right back.” she said. She then literally ran away with my notebook back towards the shop she had pointed to indicating that they had boiled water for us to drink. While she was gone a man approached Drew and gave him an entire case of bottled ice tea and a bag full of fruit. Soon, just as she said, she returned, but this time with a bucket full of apples, pears, persimmons, and a more serious looking husband. “Why do you want our names? What are you going to do with it?” he asked. “Oh there is no need to worry sir, I want to write a story about you so my friends in America will know how friendly Chinese people are.” I said. He then looked through all my notes, saw the names and phone numbers of other Chinese who had given me theirs and decided that it was perhaps OK to do so. “He said it was for friendship, its good, just give him our name!” the woman said. I gave them the website although they didn’t know how to use the Internet, hopefully they can find someone to show it to them. We were stopped by a Local TV crew and interviewed as we were riding out of town, we mentioned how nice the people in the town were and how they gave us gifts. Mrs Huang I hope you watched the news because perhaps you can’t read my blog and I can’t write Chinese very well anyway, but if you do stumble across this thank you, the fruit was fantastic. You are currently browsing the archives for the Adam's Posts category.